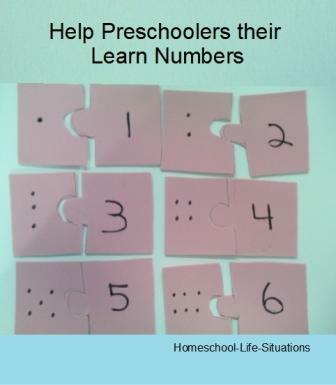 With short lessons and activities preschool numbers can be fun. I used games, picture books, and items I found around the house when I was homeschooling young children. As much as possible I kept my lessons fun. I feel that it is important for young children to love learning. Learning preschool numbers includes a lot of counting. When my children were young we counted everything. It was also something that my children did by their selves. At times I would listen for any missed numbers and correct them. Items in books -- See below for the number books we used. Duplo Blocks sort for color or number of bumps. Buttons sort for color, size, or number of holes. We also strung large beads or macaroni and make bracelets or necklaces. We also made paper chains at Christmas time. Games are another fun way to practice counting. We would play I Spy. Besides learning math I Spy is good for teaching children to listen to directions. I would think of an object in a room. Then I would describe the object. I would mention what the item was used for. In the living room I have two lamps, so I would mention in my description about there being two. Another fun activity is Simon Says. For preschool numbers you could have the child hold up one arm or jump ten times. Make the activities easy enough so your child can do them. Older preschoolers can play hopscotch. Hopscotch involves counting and number recognition. Preschoolers can also play board games with an adult or older sibling. Find simple games that use dice or spinners to move spaces. My children played Chutes and Ladders, Candy Land, and Cooties when they were younger. You can also make a number version of the match memory game. On cardstock write the numbers one through ten. You will need two sets of cards. Place the cards face down in random order. Your child needs to find the number matches. For another match game write numbers on cardstock. For each number make another card with corresponding dots. Your child needs to match the number with the corresponding amounts. 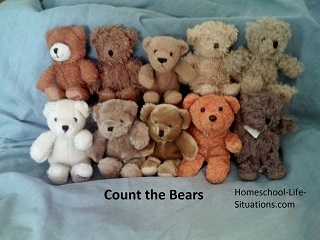 Besides counting to ten young children should be able to recognize the number shapes. For number recognition you can help your child make a number book. Staple ten pages together. You will also need star stickers. On the first page write the number one. Have your child place one star on the page. On the next page write the number two. Have your child place two star on the page. Continue writing numbers and having your child places the correct number of stars on the page. We also had wooden number puzzles when my children were young. There are at least two types. One just has the numbers from one to nine. In the other type when you remove number there are pictures that represent the numbers. You can also make your own puzzles out of craft foam. Cut a square of craft foam. In the center draw a puzzle shape. On one half write a number in permanent marker. On the other half mark the corresponding dots. I have also seen the same project done with plastic Easter eggs. Preschool numbers can be taught with picture books. Here is a list of some of the books I remember reading to my children. There are many others available today. Also try to find number nursery rhymes in book form. So your child can look at the pictures and count the items on the page when you read the story. I really don’t like to give a preschool child a lot of worksheets to do. But there are some that would be fun for young children. I bought a lot of coloring books when my children were preschoolers. The books usually had some color by number and dot to dots. Free Coloring Pages has several number activity pages. There are several easy dot-to-dot pages, color-by-number, and color the animals that have two or four legs. If I still had preschoolers I would use this site a lot. Besides number pages there are cut and paste activities, coloring pages, and letter sound worksheets. With daily practice and fun activities your child will learn his preschool numbers.